It was sometime in mid1750s. The pontiff of the Raghavendra Swamy Matha was Vadeendra Theertha. He was the great grandson of Raghavendra Swamy who had entered Brindavana in Mantralaya in 1671. Vadeendra Theertha was the son of Purushottamacharya who in turn was the son of Lakshminarayana, the only son of Raghavendra Swamy. In his Poorvashrama, Vadeendra Theerta was called Srinivasacharya. Vadeendra Theertha had finished composing Guru Guna Sthavana, a beautiful work, praising his ancestor Raghavendra Swamy and also detailing his works. Vadeendra Theertha decided to dedicate the work to Rayaru and he went to Mantralaya and stood before the Brindavana and began reciting the composition. He was the Peetadhipathi of the Sri Raghavendra Swamy Matha from 1750 to 1761. Minutes went by and the melodious voice of Vadeendra flowed around the Brindavana attracting devotees and pilgrims who also stood respectfully in front of the Moola Brindavana of Raghavendra Swamy. When Vadeendra Theertha completed reciting the works, the Brindavana of Raghavendra shook and nodded its approval. Even to this day, the Brindavana of Raghavendra can be seen titled to one side. This is because of this incident. Guru Guna Sthavana is a work of 36 verses in honor of Rayaru. It gives us the dates chronologically of the compositions of Rayaru and also the circumstances under which these works came to be written. Incidentally, Vadeendra Theertha was just two years old when Raghavendra Swamy entered Brindavana in Mantralaya. 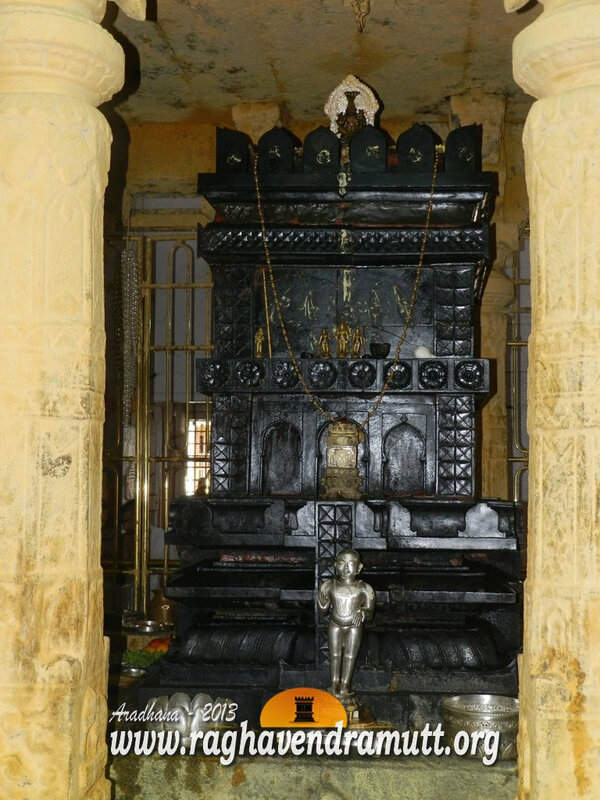 Vadeendra Theertha entered Brindavana in a structure that was originally constructed by Diwan Venkanna for Rayaru. Rayaru wanted a much simpler Brindavana and predicated that another holy saint would be entitled to sit in the Brindavana meant for him a few decades later. If you look closely at the Brindavana, you can see a small crack on top. A popular story is that a woman flung a stone in anger when Rararu did not appear in her dreams and fulfill her wishes. The same night, Rayaru came in her dreams and told her he would have appeared in her dreams that night and given her his blessings. The Brindavana of Raghavendra Swamy is also supposed to have nodded its approval to the Harikathamrutasara composed by Jagannatha Dasa. Another Brindavana is also supposed to have shaken itself when a Pravachana was being conducted before it decades before the Rayaru miracle. Satyasandha Theertha of Uttaradhi Matha had come to Sangli in Maharashtra. He visited the Brindavana of Satyavrata Theertha (1635-1638) and began a Pravachana on Nyaya Sudha after completing the pooje to Moola Rama. Even as scores of people, devotees and matha officials looked on, the Brindavana of Satyavrata Theertha shook from side to side several times after the Pravachana was completed. One of the witnesses to this incident was the king of Sangli, Balraj Urs. Both these saints entered Brindavana when alive. Anpother similarity between the two saints is that after Rayaru, the Sri matha came to called as Raghavendra Swamy Matha. The Uttradhi Matha name continued but all sers occupying the peeta after Satyavrata Theertha took the prefix Satya in honour of the immense contribution of the saint to the matha and to Dwaitha Parampare. (There is another saint in the Uttaradhi Matha parampare called Satyavara Theertha. His Brindavana is at santebidanoor. His name so closely resembles to that of Satyavrata Theertha that there is confusion between the two saints). There is a beautiful Brindavana next to that of Raghavendra Swamy in Mantralaya. This is the final resting place of the great grandson of Rayaru himself. Known as Vadeendra Theertha, he was one of the pontiffs of the Sri Raghavendra Matha. Vadeendra was just two years when Raghavendra Swamy entered Brindavana in Mantralaya in 1671. Vadeendra was the son of Purushottamacharya, who in turn was the son of Lakshminarayana, the son of Raghavendra Swamy. Vadeendra Theertha’s poorvashrama name was Srinivasacharya. He was a disciple of Upendra Theertha and later in 1728 became the Peetadhipathi of the Raghavendra Swamy Matha. He was the head of the matha till 1750. Vadeendra Theertha was a noted scholar of his times and he had a large number of disciples. His most outstanding work is Gurugavanastavana, a work on Raghavendra Swamy and his works. When Vadeendra Theertha completed Gurugavanastavana, he thougt it fit to read it before the Brindavana of Raghavendra Swamy. When he completed it, the Brindavana shook as if in appreciation. Even today, we can see the Brindavana of Raghavendra Swamy tilted to one side. In this work, Vadeendra has interspread metres and alankaras with the sragdha metre that he has used throughout. The work deals with the greatness of Hari Vayu and talks about Vyasaraja, Vijendra Theertha, Sudeendra Theertha and Raghavendra Theertha. This comprises 36 verses and details the circumstances under which Raghavendra Swamy wrote his works. During this period, South India was in turmoil. The Vijayanagars had already bowed out and the Adil Shahs of Bijapur had ceased to exist. The Mughals had lost control over south India and many palegars were trying to asset their independence. The religious institutions, including the Raghavendra Swamy Matha, were finding it difficult to survive. Many of the properties of the Raghavendra Swamy Matha were under threat. It was during this time that Vadeendra Theertha showed his meetle as an administrator. He first came to Ranebennur where lands of the matha were on the verge of being taken away. He got the lands restored to the matha. The Nawab of Savanur gifted to the Mutt lands at Rettehalli. The Desai of Havanur, Nadagouda, gifted estates in Moraba village. The seer accepted these gifts and came to Hubli. He visited the village of Kiritagiri which had been gifted to Raghavendra Swamy. However, the village had later gone out of the hands of the matha. Jayavantabhai Venkatappayya Bahadur Desai Paragane, the Desai, once again gifted the village to Mantralaya Matha in 1734. When the seer reached Mantralaya, he saw that the matha was about to lose control of the place that had been gifted by Sidhi Masud Khan. The seer then discussed the issue with Muzaffarjung Bahadur, the administrator of Adoni. The administrator handed over the documents reconveying Mantralaya to the matha. Vadeendra Theertha wanted to go to Tamil Nadu but by now he realized that his end was near and he stayed back at Mantralaya. He ordained Vasudendra Theertha as his successor and entered Brindavana. This was the Brindavana that Dewan Venkanna had initially built for Rayaru sometime in 1670. Rayaru then told Venkanna that he did not want such a beautiful Brindavana but a much simpler one. Rayaru himself predicted that an erudite scholar and equally holy person would be the deserving person to occupy the Brindavana and this man was Vadeendra Theertha. This Brindavana is to the left of Rayaru. By the way, Vadeendra Theertha has written some Devaranamas in Kannada of which some still exist.